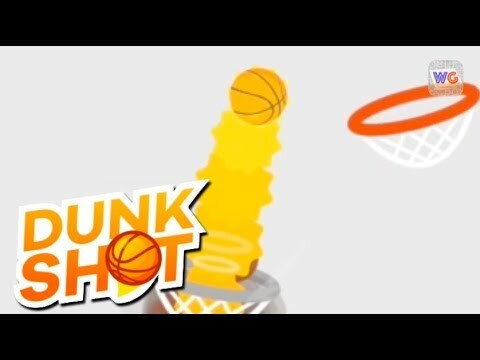 Today I am here to make a review of a game called Dunk SHot Basket published by Ketchapp. These guys know how to make addictive apps and believe me this game is also like that. Dunk Shot is a highly addictive basketball shooting app that keeps players coming back. Free to download and play, Dunk Shot does feature ads and in-app purchases and is rated for users ages four years and older. This app is safe for kids but setting password-protected purchases and discussing spending expectations can easily alleviate any concern. In-app purchases range from $0.99 to $1.99. Players are able to collect in-game currency, which is awarded through successive gameplay, but purchasing star packages is a much quicker return. Those players opting to play the Dunk Shot app for free, without forking over money for additional in-app purchases, will see an ad banner prominently displayed across the bottom of their screens. Advertisements also pop up on the screen immediately after a player loses a round, with another thumbnail ad appearing towards the top of the screen. And now let`s go to the gameplay review and see what we have here. I am sure that this game will attract a lot of attention. Because it is rare to see such a simple and yet addictive game. High scoring players who miss a basket will receive a timed offer to watch a video add in order to resume their game afterward or they can opt to hit “No Thanks” to exit the game. Players who opt out of watching a video ad for continued gameplay are yet again bombarded with an offer in exchange for watching a video advertisement. When Dunk Shot begins, players swipe to move the slingshot-type shooter to align their shot and then tap to release the ball. Players receive points for each shot made, with additional points being awarded for bank shots, or bouncing the ball off of the side of the screen to make the shot. Each net is placed higher on the screen from the last, essentially having players make basketball shots to ascend higher and higher. Honestly, it is a good game but I need a little more action. Just shooting balls is not enough for me. As I said earlier, it is a fun game that can lose some time. But nothing more.